A second aspect of the new proposed tier is giving employees a chance to jump ship from the defined benefit pension plan (UCRS) to just a 401K plan. A new study from UC Berkeley’s Center for Labor Research and Education shows that “defined benefit pension plans” like UCRS provide higher, more secure pension income than 401k-style plans. UC staff also have expressed concerns about “proposed retirement benefits plans, reports the Daily Californian. For union members, benefits are subject to negotiation. UC Office of the President scheduled webinars in February to field questions and ask for feedback. 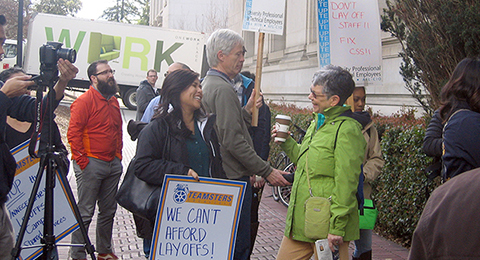 The second one will be held Wednesday, Feb. 10, 1–2:30 p.m.
A demonstration at UC Berkeley against layoffs at Campus Shared Services last week drew dozens of protestors who delivered petition signatures against the administration’s move. Union activists and their supporters in the faculty are demanding transparency and a new look at the situation in the division. More on the “black box” software system we reported on last week, which some faculty and staff say intrudes on their privacy rights from ArsTechnica. The UC Regents, in a 15–5 vote, decided in January to fire a tenured Riverside professor of English for violating “the Faculty Code of Conduct, specifically its substance abuse and sexual harassment policies,” reported a UC Office of the President spokesperson to Inside Higher Ed. The professor believes “shared governance and his academic freedom have been violated” and intends to sue. Nine hundred healthcare workers at USC’s Keck Hospital will engage in a one-day strike on February 10. Staffing shortages and substandard wages and benefits are the chief issues. The workers, represented by the National Union of Healthcare Workers (NUHW), will be joined by 1,200 nurses under CNA. The National Labor Relations Board has announced results of two non-tenure-track faculty groups at the University of Southern California that have voted to unionize. Faculty in the Roski School of Art and Design joined SEIU by a vote of 31 to 6, and faculty from the school’s International Academy voted 32-3 to approve union representation. That makes USC the largest private university in the state to have union-represented faculty.